Rebecca Halls began studying dance at the age of five in Comox, BC with dance teacher Margaret McQuaid. Through the initial inspiration and encouragement of this wonderful teacher, Rebecca went on to complete upper level exams of the Royal Academy Ballet Training, followed by studies of Cecchetti Ballet & Modern Dance with Gillian Kilgour, Tap & Jazz with Pat Pantuso. During her world travels Rebecca discovered the art of Yoga, and soon after, Hoop Dance. After moving to Montreal in 2005 to study circus arts, Rebecca was accepted into the Contemporary Dance Program at Concordia University. Rebecca completed her BFA in Dance & Choreography and has since worked with Director & Filmaker Marites Carino to create the Bravo Fact Film, Hoop. Hoop premiered at the EMPAC Film Festival in September 2010, and had it’s European Premiere in Amsterdam at the Cinedans Festival in 2010. Rebecca is based in Berlin, Germany and travels internationally to perform on stage in theatres and sometimes with musical acts. 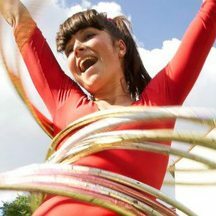 She also teaches hooping & yoga workshops to the ever evolving international community of hoop dancers. She is the founder of IHOOPU, one of Canada’s leading Hoop Education Programs in Montreal, Quebec.